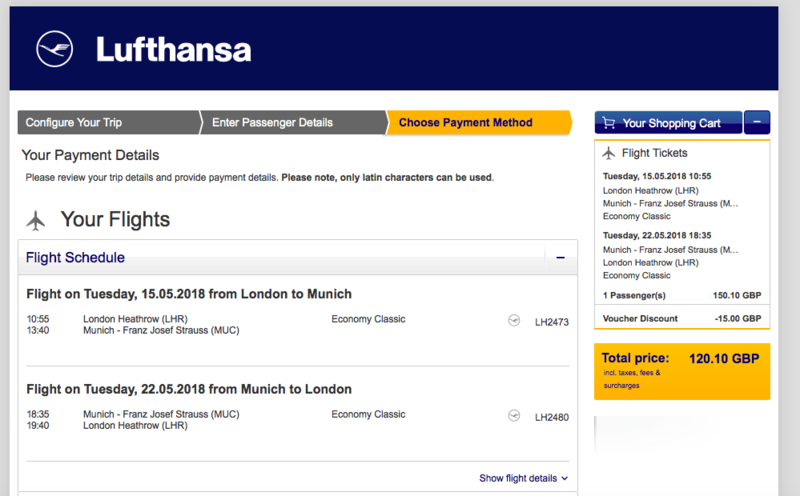 Lufthansa has loaded a £15 voucher for departures from the UK – as a ‘Mother’s Day Gift’. The details in a nutshell: You must book this weekend, by Monday 12 March at the latest. You can travel between 8 April and 29 June. Judging from the above, you might receive a £15 discount each way, but it may well be a bug. I couldn’t find anything in the t&c’s to clarify this, so I would assume that it is £15 off per booking rather than £15 off each way. 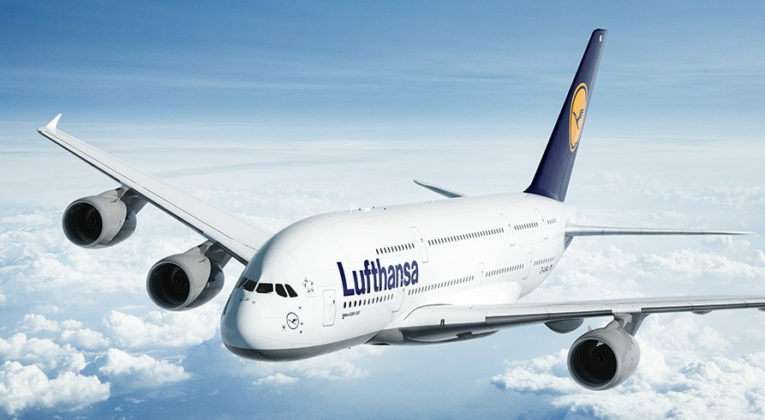 Note however that this voucher will only work for flights operated by Lufthansa and Lufthansa Cityline. This essentially limits this voucher to short-haul flights to Frankfurt and Munich or to a long-haul booking via these hubs. Other German cities are served by Lufthansa’s low-cost subsidiary Eurowings from the UK, so this voucher will not work. Also note that the voucher only reduces the fare, but cannot be applied against any taxes. In the dummy booking above, I deliberately selected the slightly more expensive Classic Fare, including a checked bag, in order to qualify for the discount. I had originally chosen a hand baggage only fare, at roughly £100 return, but the fare was too low and the taxes too high for the discount to be applied. Lufthansa still offers free drinks and snacks on short-haul flights. It is always nice to save money on flight bookings. It is a shame however that this voucher only really works on Frankfurt and Munich flights – the only cities that Lufthansa and Lufthansa CityLine serve from the UK. Full details on the dedicated promo page here. The voucher can be redeemed on the payment screen – after the selection of the entire journey. The voucher displayed can be redeemed on the same day, between 00:00 hours of a calendar day and 23:59 hours of the same calendar day (CET – Central European Time). The Voucher Code will be displayed on LH.com on 08.03.2018 – 12.03.2018 and is only valid on the day of dispatch. The Voucher is valid for flights from 08.04.2018 – 29.06.2018.The voucher is only valid for flights departing in United Kingdom and can only be redeemed at www.lufthansa.com. The voucher is not valid in conjunction with any “Access Code” used to purchase already discounted fares. Vouchers may only be used for flight tickets, not for rebooking charges (MCOs), excess baggage tickets, seat reservations or other flight related / ancillary products. Vouchers cannot be used for flight reservations with price guarantee (Secure your fare) or flight bookings resulting from a reservation. Vouchers cannot be used for flight bookings with infants (up to 2 years). If the value of a ticket bought with a voucher is used as a down payment for a higher-priced ticket (e.g. towards a higher tariff, flight rebooking), only the reduced value of the ticket is put towards the value of the new ticket. The voucher is intended for personal use only. Its resale or any other transfer to a third party is prohibited. In the event of a contravention, Lufthansa, or a third party authorized by Lufthansa, reserves the right to refuse to redeem the voucher. 15 quid saved, thank you Insideflyer! OT but I am sure this will be of interest to many readers. Could one of you beautiful contributors run an article on achieving SUCCESSFUL best price guarantee claims with the various chains please?